« Breathe in the Beauty Around You! There is no reason to go to war over Essential Oils! 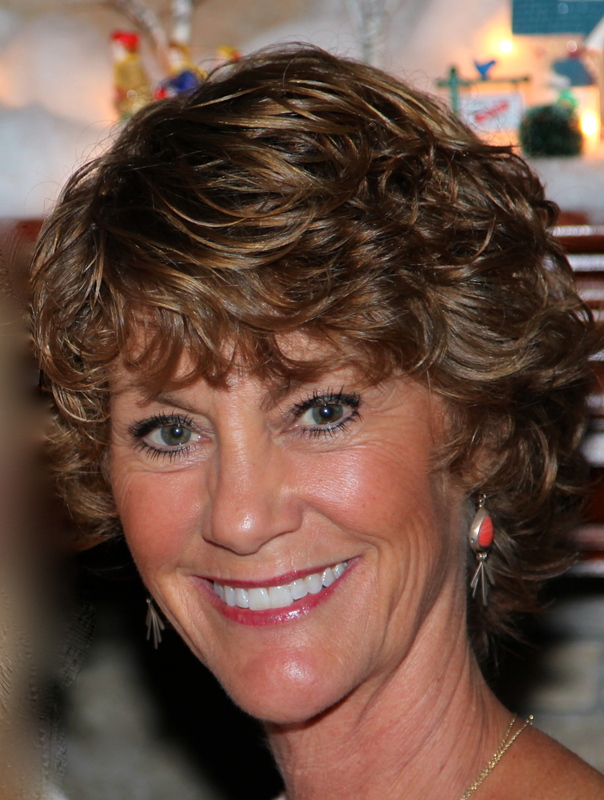 What has just been launched will change the essential oils industry going forward. The new company, Améo has developed patent-pending technology that confirms the clinical grade quality of it’s oils, something no other company can currently provide. The new oils surpass the quality and clinical purity of it’s competitors. What this means, is that Améo is the only company that can prove with complete transparency the constituents of each oil. This company is changing the way the world looks at essential oils. Because of their claims for 100% purity and clinical grade essential oils, Améo will most likely be asked one day to back up their claims, as no other company has the ability to prove, per lot and batch number, the clinical purity of the oils. In order to be considered “clinical” quality the oils must be in the purest form and must be backed by peer reviewed clinical studies and have the ability to prove the claim with science. Though this innovative ground breaking technology, Améo can now actually prove cell permeability through this innovated technology, and consumers have the ability to look up each batch number to view the test results, Gas chromatography, purity and PH of the soil, and watch the oil permeate the cells under a microscope. This technology is not available currently with any other company. The transparency behind the testing, will eventually move other essential oil companies that claim 100% purity to prove their claims. Unfortunately, many of them cannot at this time because although they claim their oils are pure, only 40% is needed to make that claim. All essential oils are not created equal, even in those companies that have been around for more than 20 years. There has been much chatter over the launch of these new oils by long-standing companies that have been around for decades. The testing however, can not be disputed. Testing the vibrational frequency of these oils prove beyond a shadow of a doubt the purity far exceeds that of any other oil on the market without naming companies. Take a look for yourself. *This article contains direct affiliate links to purchase via www.lwalling.myameo.com. In fairness, if another representative shared this article with you, please contact them directly for more information or to order. Améo Essential Oils are unlike any essential oil in the marketplace. The only company endorsed by Dr. Daniel Pénoél, a world renown doctor working in the field of aromatherapy since 1977, with an international reputation as an essential oil researcher, aromatic medicine practitioner, educator, and author. Many of the leading essential oil companies have sought after Dr. Daniel Pénoél to endorse their company, and until now this is the first company he has openly endorsed. In fact, Dr. Pénoél is on the board at Améo and has been deeply involved in creating the proprietary blends just launched in September 2014. The God-Father of essential oils is directly involved in the creation, testing, and vision of Améo Essential Oils. Améo‘s new technology is unlike anything used in the industry today and ensures the pure clinical quality of Améo Essential Oils. This new method of research and quality is patent-pending to secure Améo as the new leader in essential oils! In today’s essential oil market there are numerous outlets where an individual can procure oils. However, not all oils are created equal. There are countless levels of quality and purity. At Améo, the entire purpose was to discover the highest “verifiable” grade or standard that is not developed by some marketer, rather true proven science. Through a lot of hard work, passion, and dedication they have been able to uncover the highest quality and standard of oils. In addition to quality, we have also elevated the level of science. The kind of science that builds bridges between the eastern and western philosophies of health care. Améo truly is a revolutionary company! Améo is destined to be one of the top companies in the industry. They have world class leadership from the founder and corporate partners, fantastic field leadership, amazing product and technology, lucrative compensation plan, and most importantly culture. Ameo employs a culture that celebrates hard work and success. 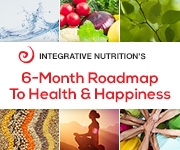 I want everyone to have the opportunity to experience the rare chance to be on the ground up of and amazing company while getting healthy and earning a residual income for years to come. For more information on “How to Create Income”. The Améo products and business opportunity have revolutionized the health and wellness world and changed the way people look at taking care of mind, body and soul. All Améo Essential Oils are CERTI-5™ validated, meaning that they’ve passed extensive testing for quality, purity, and usability. Ameo also takes additional steps to make sure that each oil is cell active and permeable for maximum results and is the same or better quality than oils used in clinical testing. Améo means soul in French. 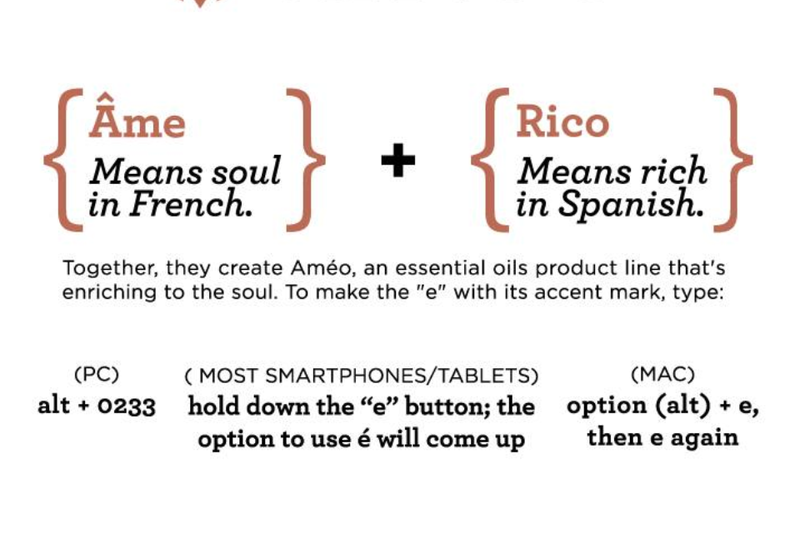 Rico means rich in Spanish. Together, they create Améo. Take a good look at Améo, a product line that believes in Rich Souls. This new line of essential oils will help you continue to feel your best, look your best, be your best, and have the energy and vitality needed to enjoy your life; this new life begins with the numerous benefits of using these oils on a daily basis. Join us and start building your team from the ground up today. Améo Essential Oils are extracted from nature’s most generous trees, herbs, plants, seeds and fruits, and we’re proud to share them with you and those you care about. Use these luxuriously pure and high-quality essential oil singles to help you feel your best, look your best, be your best, and have the energy and vitality you need to enjoy your life. Améo Essential Oil blends are comprised of an exclusive combination of individual oils that help promote enjoyable and beneficial user experiences for the mind, body and soul. 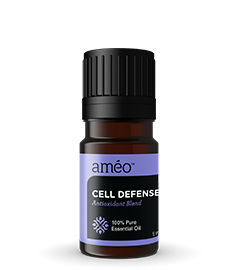 Améo’s oil blends work at the cellular level to provide everyday solutions, including weight management, enhanced mind and memory function, anti-aging, respiratory support, muscle relief, improved overall well-being, and more. Learn more about Améo’s Essential Oil blends below. 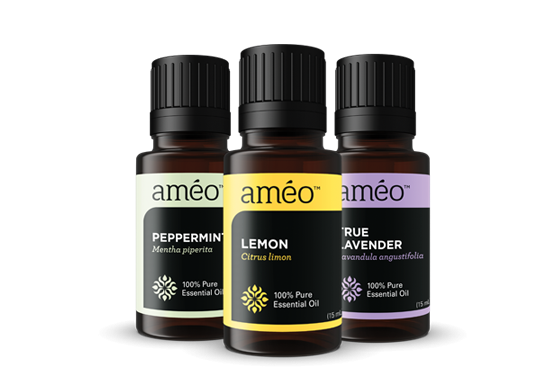 We wanted to provide you with everything you need to make your Ameo Essential Oil experience easy and enjoyable. These products will help you become better acquainted with your essential oils. Whether you choose to mix your favorite oil with Ameo Fractionated Coconut Oil and apply it topically or diffuse your go-to blend in one of our exclusive diffusers, these tools will help nourish the Rich Soul inside of you. Contact us or enroll HERE! 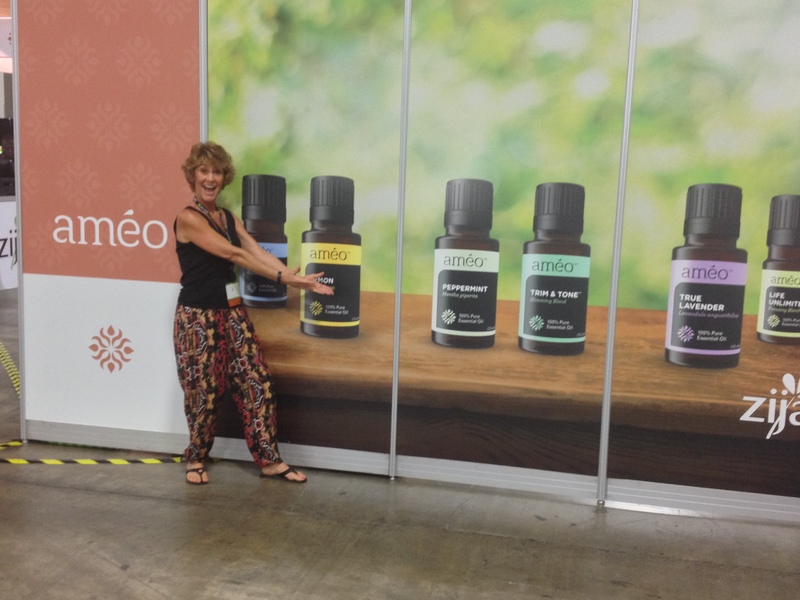 I love Améo Oils….they are améozing!